Bill Lear is a staple at The Conservation Center. Not only have we collaborated on maintaining his extensive collection, he is also an active member of our Advisory Board. Over the years, we have come to know that there is always an incredible story with Bill's requests. Past projects have ranged from conserving the Army discharge papers of his great-great-grandfather from the Union Army in 1856, to fabricating a display for a Tibetan Yak bell acquired while trekking to Camp Three on Mt. Everest as a member of Jim Whitaker's International Peace Climb in 1990. So when he arrived at The Center with two signed Shepard Fairey pieces to be framed, we knew we had to ask. The two screenprints are from the album artwork for Fairey’s band, Noise Project. While most know Fairey for works such as the Obey Giant and Barak Obama’s “Hope” image, Fairey also co-produced the Noise Project album with Bill’s daughter, Merritt Lear. Merritt is a professional musician who is currently based in LA. Taking up the violin at age two, Merritt has since made a name for herself as an accomplished violinist, fiddler, guitarist, and singer. It's fun to hear Bill describing Merritt’s first violin lessons, which began as a toddler. At the first lesson, a pad is placed on the ground with footprints and the child places their feet on each print. They are then given a box to hold and while there isn’t a note played in the first six months, the child learns to master the posture needed to play. The first violins are 1/8th the normal size of the instrument and as the child keeps growing, the violin is replaced with a larger one. Bill explained that even after years of practice, most children who study the violin realize they are not going to be the world’s greatest violinist and grow discouraged. Merritt came to this same conclusion around age twelve and almost gave up the violin entirely until her parents persuaded her to practice only twenty minutes a day four times a week. Merritt agreed, and soon after the violin took hold of her again. In college at Yale, she took up the guitar in addition to the violin. Post-graduation, Merritt joined the Chicago-based band the Drovers who were influenced by traditional Irish music. During one of the tours of the Midwest, Bill attended a show at The House of Blues. Despite positive reviews, Bill helped Merritt realize that the future she was seeking lay outside of Celtic rock. Merritt left the band that evening and moved to Los Angeles shortly afterward. Upon arriving in L.A., Merritt waded into the fray of musicians with small concerts and jam sessions. After a year of living in L.A., someone she met at one of the jam sessions became the manager of Jason Mraz’s world tour. Mraz had been working with singer Colbie Caillat, who was not available for the tour so they began looking for someone to replace Caillat and held auditions for the position. The manager remembered Merritt from a jam session and invited her to the tryouts. After landing the spot on the tour, Merritt toured the world with Mraz for a year and a half. 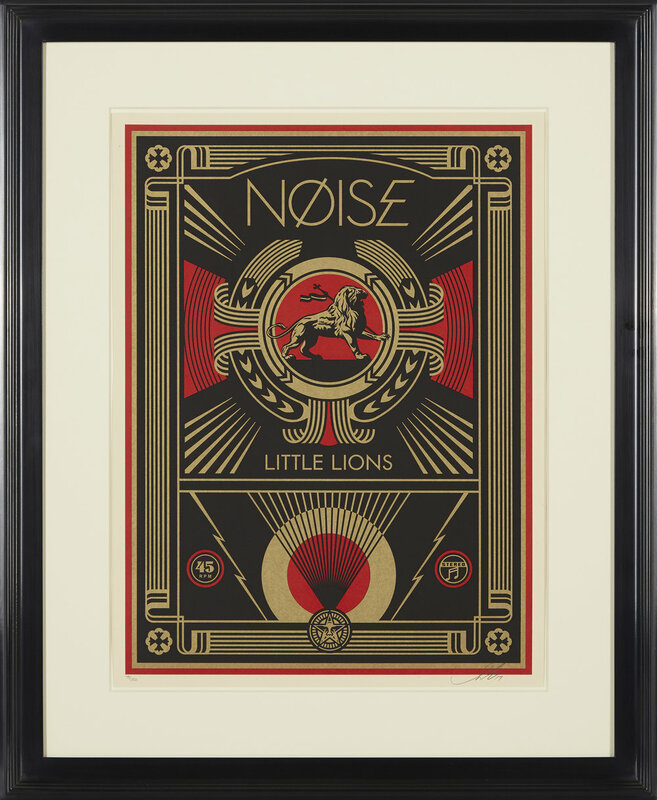 Because of the visibility from the world tour, Merritt was introduced to Shepard Fairey and he invited her to be the lead singer for the album for Noise Project. “We really couldn’t be prouder of her," said Bill. After he acquired the two autographed copies of the album cover's artwork, Bill wanted a meaningful display for the prints that would stand the test of time, and immediately thought of The Conservation Center. We began by float-mounting the screen prints on a sympathetic-toned mat with 3" margins to conservation standards. The pieces were then assembled with Museum Glass, a conservation grade, anti-reflective glass that protects against UV light rays. Then the pieces were installed into the selected frame and a coroplast backing board was attached. Finally, appropriate hanging hardware was installed. We can't wait to frame Merritt Lear's next albums too! View the full video of Little Lions below.